Due to Portsmouth being such as flat city and nowhere more than twelve feet above high tide level disposing of waste water was a problem in the 1800’s and so a solution was needed. In 1864 a system of drains was laid to bring storm waters and waste from the population flowing to the land at Eastney where the pumping house was built. Eastney Pumping Station was positioned based on the location of the sewage outfall pipe which was decided by the Borough Engineer in 1864. At this time the area surrounding the pumping station was very remote. The pumps had to operate to lift the waste from the lower pipe up to a higher level sewer which continued into the tide mouth of Langstone Harbour. The pumps had to stop during high tide and the sewers became blocked. In 1886 two powerful engines were built and installed. The two engines were supplied by James Watt of Birmingham and after 67 years are in superb condition. 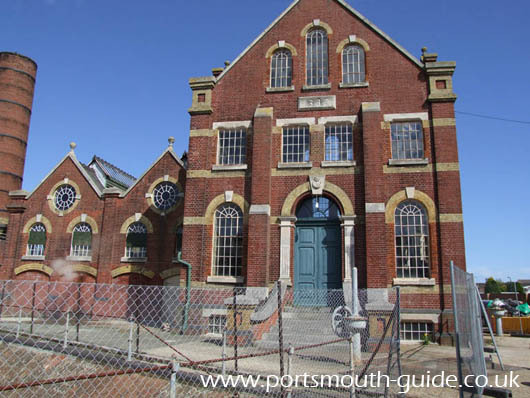 As the population of Portsmouth grew the system had to be extended with four additional underground storage tanks being built in 1904. In 1954 the maintenance of the engines and pumps for standby use was discontinued and the restoration of the beam engine house began. The beam engine house was opened to the public on 30th June 1972 and provides a fine example of a steam powered beam engine. The beam engine house is maintained by volunteers and so is only open to the public on the last weekend of every month. In 2001 Southern Water pumping station was built and although this used new engines it still uses the same underground drainage system. In 2010 a new revised guide book was produced using some photographs from photos.portsmouthvideos.co.uk (our sister site).